Home › Technical Analysis › Chart Analyses › ARRIUM (ARI) – Chart Review. Down but not out! 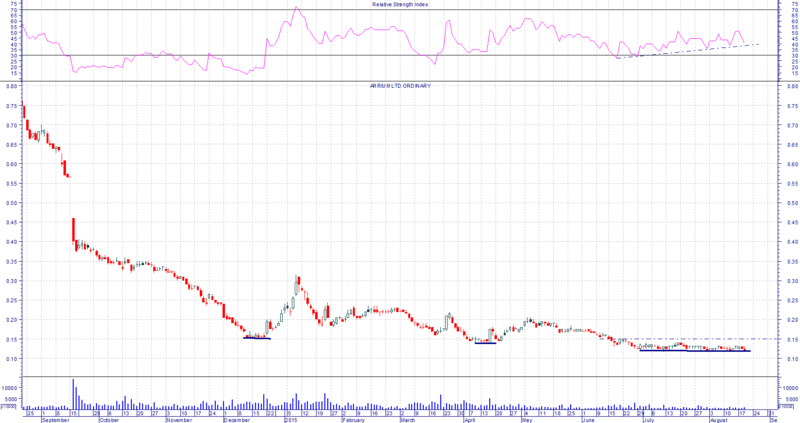 This is a 12 month candlestick daily chart of BHP steel spin-off Arrium. The chart is one you would expect to see for a speculative start-up stock, not for a world ranking iron ore miner, and global manufacturer and distributor of steel products with some 10,000 employees until recently. A 40% decline in the average iron ore market price has brought this proud and promising Australian to its present lowly position with the shares now trading at only 12 cents. Arrium is an international diversified mining and materials company listed on the Australian Securities Exchange. The company has three key business segments: Arrium Mining Consumables, Arrium Mining, and Arrium Steel. Arrium Mining Consumables comprises the Moly-Cop grinding media business, AltaSteel Steel Mill and Waratah Steel Mill, with businesses located in Canada, the USA, Mexico, Peru, Chile, Indonesia and Australia. Arrium Mining Consumables supplies resource companies with a range of key mining consumables. Arrium Mining’s operations are located in South Australia; the Middleback Ranges, approximately 60 kilometres from the Whyalla township, as well as a wholly-owned port at Whyalla. In addition to the export iron ore business, Arrium Mining also supplies iron ore to the company’s integrated steelworks at Whyalla. Arrium Steel is comprised of the Steel and Recycling businesses. The Steel business is Australia’s only manufacturer of steel long products and it is also Australia’s leading steel distribution and reinforcing steel supplier. The Recycling business has operations in Australia, as well as non-ferrous operations in Asia. The result is not all bad news despite registering a Statutory Net Loss After Tax of $1.918 billion. Included in this huge loss are restructuring costs, and write-downs. The sales revenue was $6,086 million, down 13% pcp as a result of the declining iron ore price. Underlying NLAT of $7 m.
The operating cash flow fell from $679 to $112 million. Gearing is 40.7% with net debt at $1.75 billion. $200 million debt has been re-financed to FY17. The cost base has been reduced by about $100 million per annum. The declining share price has been associated with declining volatility, and diminishing volume reflecting investor disinterest in the face of the weakened trading conditions. For the coming year Arrium is targeting an average break-even cash price of US$47/dmt. Despite the un-reponsive share-price, the RSI is in a gentle uptrend, suggestive of a bullish divergence. On the basis of this report it would not surprise me to see some institutional accumulation of the shares. Retail investors however would be wise to wait for more positive trading conditions, and the emergence of an uptrend. Arrium has made considerable progress in restructuring its operations to remain viable in the face of the low iron ore price. Its position is strengthened by having sound and growing steel manufacturing businesses.